Here is an incomplete list of significant occurrences of religion and spirituality (human as well as alien) in Star Trek. Please note that trivial references to mythology or lines like "Oh my god!" are not included, as they would give us an endless list. The following is some evidence for the existence of human religion in the future. 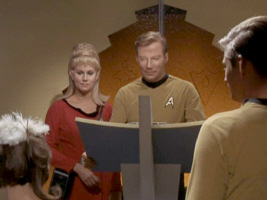 In the wedding chapel on the Enterprise we can see a sort of altar and a number of religious symbols, among them a cross (TOS: "Balance of Terror"). Cross in TOS: "Balance of Terror"
Bindi on Lt. Rahda's forehead in TOS: "That Which Survives"
A remarkable example for a lack of religiousness comes from Edith Keeler who doesn't mention God once in her address to the people in her otherwise obviously Christian mission in New York in the 1930s (TOS: "The City on the Edge of Forever"). Kirk says: "Scotty doesn't believe in gods" and also "Man has no need for gods. We find the one quite sufficient". This almost sounds like Kirk is supposed to be Christian, Jewish or Muslim (TOS: "Who Mourns for Adonais"). After the Companion has taken over the body of Nancy Hedford, Spock objects, "Companion, you do not have the power to create life." Companion-Nancy replies: "That is for the Maker of all things. ", referring to the existence of a god (TOS: "Metamorphosis"). Spock compares the Tribbles to "lilies of the field. They toil not, neither do they spin." This is from Matthew 6:28 and Luke 12:27 (TOS: "The Trouble with Tribbles"). The rebels on Magna Roma, a nearly perfect "Parallel Earth", seem to worship the "sun", which is actually (God's) "Son". More precisely, Spock rules that "Sun worship is usually a primitive superstition religion", whereupon Uhura corrects him: "Don't you understand? It's not the sun up in the sky. It's the Son of God." So the episode is remarkably supportive of Christianity as some sort of "advanced" religion (TOS: "Bread and Circuses"). McCoy thinks that Spock would need him in the "lion's den". Spock answers: "Daniel, as I recall, had only his faith.". He obviously recognizes the reference to the Book of Daniel. In the same episode, McCoy says, "What in the name of Heaven is this?" Scotty replies: "Heaven's got very little to do with this" (TOS: "The Gamesters of Triskelion"). The computer M-5 states: "Murder is contrary to the laws of man and God" (TOS: "The Ultimate Computer"). Another astonishing reference from TOS is a dialogue between two researchers, of whom at least one is clearly religious, when there is a quake on Minara II. Dr. Ozaba: "In His hands are the deep places of the Earth. Psalm 95, verse 4." Dr. Linke: "Looks like He was listening" (TOS: "The Empath"). Bridge officer Lt. Rahda is wearing a bindi, a traditional Hindu symbol, on her forehead (TOS: "That Which Survives"). Data mentions a Hindu Festival of Lights in his log entry. So this religion, or at least its rituals, still seems to exist (TNG: "Data's Day"). On a related note, there is a mention of a Christmas party too (TOS: "Dagger of the Mind"). The "Scottish" Caldos Colony includes a church or chapel beside the graveyard, which may be more than just decoration, and we can hear the attendees say "Amen" at Felisa Howard's funeral (TNG: "Sub Rosa"). The American Indians on Dorvan V continue to practice their old rituals such as vision quests. Picard says he has the deepest respect for them (TNG: "Journey's End"). Captain Picard celebrates Christmas with his family in the Nexus in a very traditional fashion, even by 21st century standards. This is astounding not only considering that the holiday has largely lost its religious significance already in our time but also because it takes place in the dream world of a man who otherwise deprecates religion ("Star Trek Generations"). Kilana asks Sisko: "Do you have any gods, captain?" He says, "There are *things* I believe in." (DS9: "The Ship"). Joseph Sisko recites from the Bible to his son's surprise. Joseph also appears as a priest in Ben's hallucination (DS9: "Far Beyond the Stars"). Kasidy Yates says she would like to have a priest to perform the wedding ceremony (DS9: "Penumbra"). The holographic Leonardo da Vinci says that he sometimes prays to God for inspiration. Janeway thinks this isn't going to work for her. (VOY: "Scorpion, Part I"). 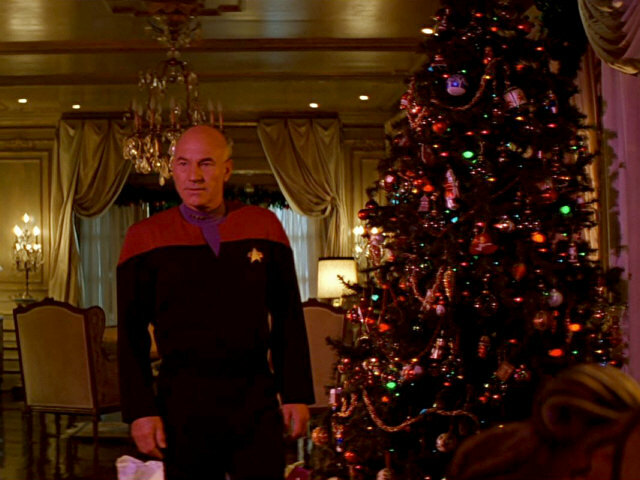 Picard's Christmas in "Star Trek Generations"
Church interior in VOY: "Spirit Folk"
The Doctor acts as a Roman Catholic priest, the first time in Star Trek that a human religion is a part of the story - albeit only in a holodeck scenario. The interior of the church is wrong, the altar is empty and there is no crucifix (VOY: "Spirit Folk"). Dr. Phlox says he has been to a Tibetan monastery and that he has attended a mass at St. Peter's Square. This is the most definite statement that religion still plays a role, at least in the 22nd century (ENT: "Cold Front"). 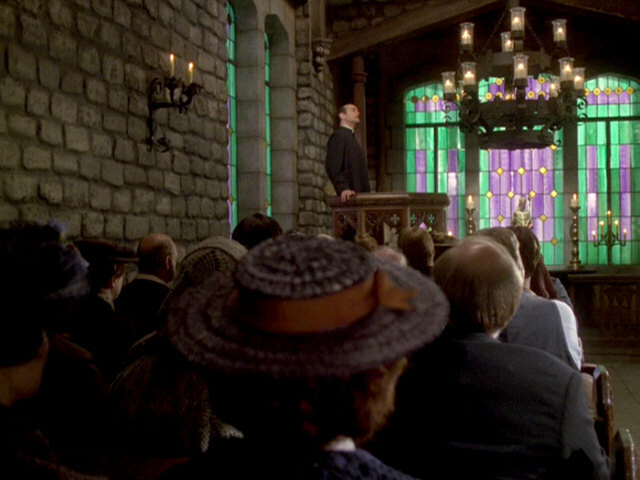 Dr. Phlox appears as a priest on Porthos's funeral in one of Archers's hallucinations (ENT: "A Night in Sickbay"). The "Red Angel" evokes the concept of (guardian) angels as in the three Abrahamic religions: Judaism, Christianity and Islam (DIS: "Point of Light"). Inspired by the apparition of the winged figure otherwise known as the "Red Angel" who saved them, survivors of World War III created a new community, in which they merged the concepts of their "old" religions, namely Christianity, Judaism, Islam, Hinduism, Buddism, Shinto, and Wicca (DIS: "New Eden"). This is evidence about the Vulcans, Klingons, Bajorans or any other aliens whose religions are shown in more detail, but only since the later seasons of TNG. Worf visits the monastery of Boreth where Kahless, the famed Klingon religious figure, reappears. In the course of the episode Kahless turns out to be a clone (TNG: "Rightful Heir"). While the Klingons otherwise generally don't practice a religion, the Klingon afterlife, Sto-vo-kor, is repeatedly in the focus of interest (DS9: "Image in the Sand", "Shadows and Symbols"). The Klingons don't have a burial ritual. They just dispose of dead bodies (VOY: "Emanations"). After an accident B'Elanna apparently enters Gre'thor, the Klingon version of Hell. It does not become entirely clear whether she was really there or if her mind made up everything (VOY: "The Barge of the Dead"). At least some Vulcans, such as notably Sybok, believe in an idyllic place from which they as a people were born. Their name for this place is Sha Ka Ree ("Star Trek V"). Ancient Vulcans practiced a polytheistic faith. Among their gods were the gods of War, Peace and Death (TNG: "Gambit, Part 2"). Spock, traveling back in time to save his own life, presents himself to his parents as a cousin making a ritual journey "to honor our gods". Both Sarek and Amanda let this pass without comment, indicating that at least some Vulcans maintained the traditional faith even after the advent of Surak (TAS: "Yesteryear"). The monastery of P'Jem, erected some 3000 years ago, is one of the most sacred places for many Vulcans (ENT: "The Andorian Incident"). Approximately 2000 years ago, in a time of devastating atomic warfare, a philosopher named Surak codified a system of belief based on logic and the repression of emotions. This system eventually came to be the basis for modern Vulcan civilization. This time came to be known as the "Time of the Awakening", or sometimes the Vulcan Reformation. Surak's teachings were recorded in the Kir'Shara, essentially a Vulcan Bible (ENT: "Kir'Shara"). Among the precepts of Surak was the concept of the katra, referred to as the "living spirit" or "all that which is not of the body", effectively the "soul" of the person. The katra of a Vulcan could be stored in a katric ark, or carried by another person, presumably so that the essence of what that person was would not be lost, and could even be consulted with by knowledgeable Vulcans. In the extremely rare case of a Vulcan's body regaining or retaining life after the transfer of the katra, it was possible to attempt to return it to the body via a process called Fal-tor-pan, though it was dangerous and difficult, with no guarantee of success ("Star Trek III", ENT: "Awakening"). T'Pol says she doesn't believe exactly everything that is said about Surak. In other words, this is skepticism about the Vulcan religion much like many Christians say they don't believe everything written in the Bible (ENT: "The Forge"). There is an ongoing conflict between Bajoran faith and Starfleet science about the nature of what the Bajorans call Prophets and Starfleet refers to as "wormhole aliens". The controversy emerges when Sisko and Dax discover the wormhole (DS9: "Emissary"). The story of the Prophets is continued in several DS9 episodes that are just too countless to discuss separately. The general tendency is that the Bajoran faith grows on Ben Sisko, that the Prophets are gradually becoming more god-like and that ultimately Ben even becomes one of them. The Prophets' god-like nature becomes particularly clear in the episodes where they determine the destinies of the Bajoran people and of Sisko, respectively (DS9: "Rapture", "By Inferno's Light", "Shadows and Symbols", "What You Leave Behind"). Also, the Prophets have evil counterparts, the devil-like Pah-Wraiths (DS9: "The Assignment", "The Reckoning", "Covenant", "What You Leave Behind"). Considering that religious leaders of Earth's past, without mentioning particular examples, are condemned in Star Trek (for instance, by Picard in TNG: "Encounter at Farpoint"), it is interesting to note that Bajoran religious leaders may be just as bad, with Kai Winn as the foremost example (DS9: "In the Hands of the Prophets", "Strange Bedfellows"). Harry finds himself in a society that practices a ritual that would kill their people and transfer them to an unknown place - the afterlife. Even though the true nature of this phenomenon can be revealed and even though Harry helps an unwilling candidate to escape, the question remains if the Vhnori are not better off if they kept believing in their afterlife (VOY: "Emanations"). The Ocampa believe that their comra (their soul) is released into the afterlife (VOY: "Emanations"). The Voth scientist Prof. Gegen, who has found scientific evidence that the Voth's origin is on Earth, is accused of harassing against his government's doctrine that the race is indigenous to the Delta Quadrant (VOY: "Distant Origin"). 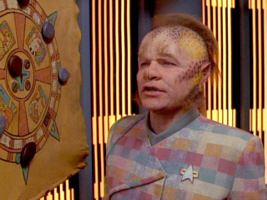 Neelix dies and is recovered using Seven's nanoprobes. 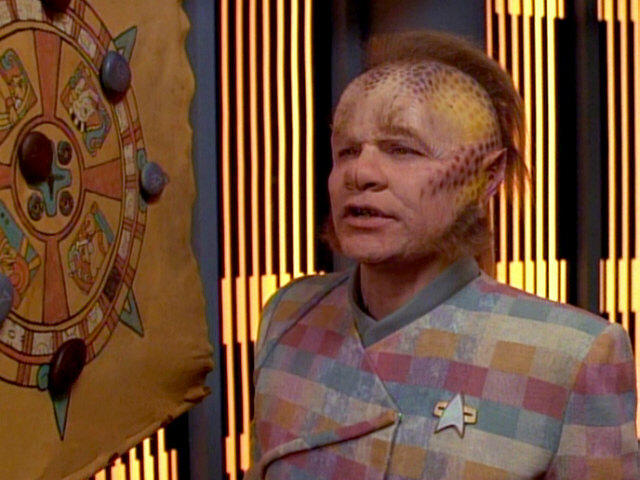 After the experience of death, or rather a lack of experience Neelix's faith is shattered so much that he would commit suicide (VOY: "Mortal Coil"). A group of pilgrims of different races worship the "Great Plume of Agosoria", a neutron burst from a protostar (ENT: "Cold Front"). A group of religious fanatics hijacks Enterprise. Different factions of this religion are struggling for the right interpretation of their faith. Archer repeatedly blames their faith, rather than their ruthless leaders, for misguiding them: "Your faith betrayed you." (ENT: "Chosen Realm"). In this very common plot, someone or something (usually technologically advanced) imposes his belief on a (usually backward) culture. There is no explicit reference to religion, but seeing how the natives used to worship Vaal, Kirk more or less destroys their faith by ridding them of Vaal and telling them that they will be better off if they can care for themselves (TOS: "The Apple"). Similar cultural interferences happen in almost a dozen TOS episodes, but not as definitely as here. In the effort to avert Wesley's execution, Picard has to argue with the Edo "god", an unidentified entity in their orbit. No effort is made to convince the Edo that it's not their "god", though (TNG: "Justice"). Picard is believed to be a god by the local populace on Mintaka, who are living on a low technological level but were so far deemed "rational". Picard strives to obey the Prime Directive, but seeing that the damage has already been done, he reveals himself as what he is -- not a god, but a mortal whose technology makes him appear powerful. Picard rejects any kind of religion as backward and compares it to superstition. He tries hard to convince the natives of exactly that (TNG: "Who Watches the Watchers?"). When the planet Ventax is about to be taken over by the alleged devil-like Ardra, Picard poses as some kind of god to demonstrate that their "devil" Ardra is not supernatural either: Picard states that people should not abide by the power of religions and myths. Still, he concedes that the faith in the contract with Ardra, signed 1000 ago according to the myth, has inspired the people to transform their planet into a paradise (TNG: "Devil's Due"). After he has been shot and his artificial heart is damaged, Q welcomes Picard with the words "This is the afterlife, and I'm God". He then demonstrates to the incredulous Picard how his life would have been, had he made a different choice in his younger years (TNG: "Tapestry"). A weird example of a religion is the relationship between the Founders and the species created by them, namely the Vorta and the Jem'Hadar. They both revere the Founders, the latter are additionally addicted to drugs. The Jem'Hadar Goran'Agar says: "The Founders are like gods to the Jem'Hadar. But our gods never talk to us. And they don't wait for us after death." (DS9: "Hippocratic Oath", "The Ship", "Treachery, Faith and the Great River"). There may be good reasons for Dukat's followers to worship the near-divine Pah-wraiths. But everything surrounding Dukat himself is a classic example of a "false god", culminating in the Cardassian-Bajoran hybrid he presents "as a sign of the Pah-wraiths" (DS9: "Covenant"). The Caretaker is a powerful entity that protects the Ocampa after inadvertently causing an ecological disaster on their planet. After his death Janeway decides to continue his work at any rate. There is no real religious mention though (VOY: "Caretaker"). Suspiria is the antithesis to the Caretaker. Her open hostility is the only reason for Janeway to fight her with moderate means (VOY: "Cold Fire"). Two Ferengi are exploiting the population of a planet, using their technology to pretend that they are the "Holy Sages" from the planet's mythology (VOY: "False Profits"). Kathryn Janeway is badly injured after a shuttle crash. An alien parasite induces a hallucination in her mind, that she has died, and that her late father has come to welcome her in the afterlife. Janeway, however, doesn't want to let go and her mistrust for her "father" keeps growing. Her "father" initially emerged from a bright white light, and vanishes in a fiery light that Janeway labels as "hell". After her recovery she muses that all reported near death experiences might be the result of an alien inhabitation (VOY: "Coda"). While it is visible in the sky for centuries, the Starship Voyager becomes a religious icon as the "Skyship" on an alien planet (VOY: "Blink of an Eye"). There is a "false god" aspect about the holographic characters in Fair Haven, but it's of secondary importance because they were programmed to be superstitious (VOY: "Spirit Folk"). B'Elanna becomes a mythical figure on an alien planet (VOY: "Muse"). The Ba'ul are "false gods" on Kaminar, the homeworld of the Kelpiens (DST: "The Brightest Star"). They created a society in which the Kelpiens would accept a premature death for the sake of the "Great Balance" because otherwise the Kelpiens would mutate (or rather mature?) to predators. These are general examples of spirituality without a definite statement about or specific reference to a religion. "Star Trek: The Motion Picture" shows V'ger on the quest for its creator, "Star Trek: The Wrath of Khan" features the act of creation, "Star Trek: The Search for Spock" has Spock's resurrection from the dead, "Star Trek: The Final Frontier" explicitly sends the ship to seek God. Another Surakian practice was the kolinahr, a series of rituals and meditations designed to totally purge all emotion from a Vulcan's mind. Attainment of kolinahr was considered a great achievement ("Star Trek: The Motion Picture"). When a false Data asks, "What is death", Picard explains that there are different interpretations, that some hope for an afterlife, while others think they will vanish into nothingness. Interestingly, Picard says that he himself believes his existence is more than a meaningless illusion, considering the "complexity of our universe" (TNG: "Where Silence Has Lease"). A spiritual aspect lies in the discovery that all humanoids are descendants of a proto-humanoid race that evolved in the galaxy 4 billion years ago. Whilst this refutes particularly the Christian view of creation, it becomes sort of a religion itself (TNG: "The Chase"). 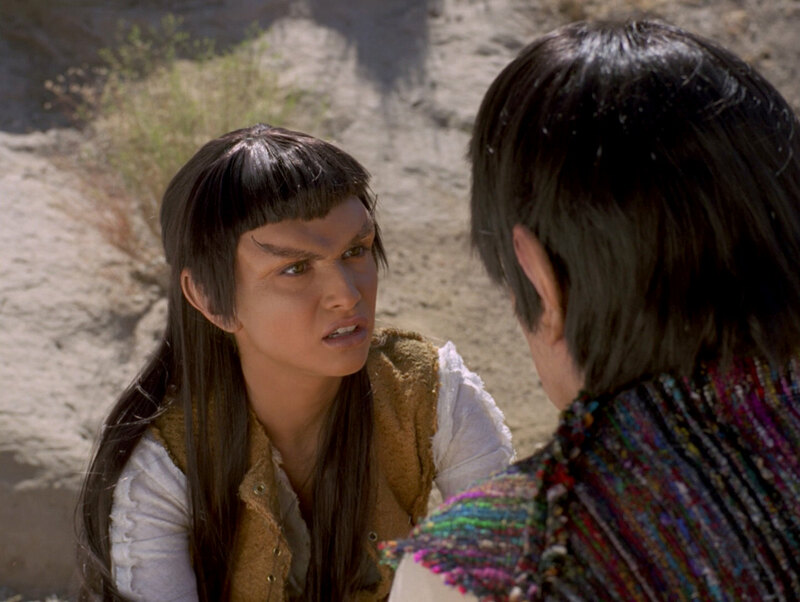 The inhabitants of Dorvan V claim that Picard was sent to their planet because his ancestor Javier Maribona Picard, a Spanish soldier, participated in a massacre of Native Americans after the Pueblo Revolt in 1680. 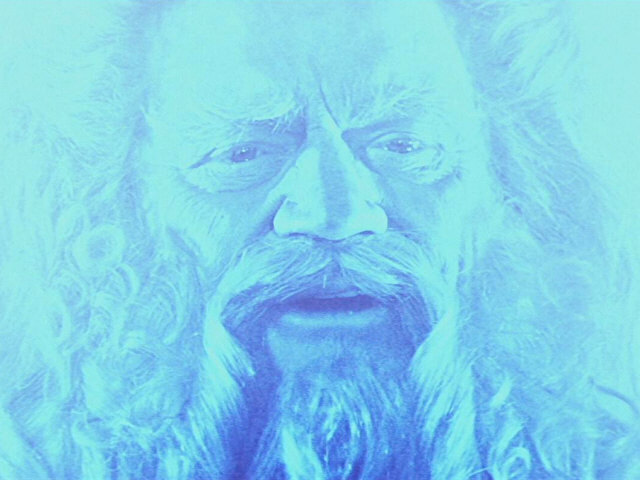 It also seems that Wesley was supposed to find his true way on the planet, although it turns out that the Traveler triggered his change of mind, rather than some kind of spirit (TNG: "Journey's End"). Chakotay is a descendent of an ancient Native American tribe. He practices rituals like meditation with an animal guide (VOY: "The Cloud"). His spirituality may have enabled him to remain alive when he is taken over by an alien (VOY: "Cathexis"). This is not completely evident, though. Aliens have brought a sort of religion to his tribe (VOY: "Tattoo"). His special dream techniques enable him to trick aliens that want to take over the ship (VOY: "Waking Moments"). Surprisingly, Chakotay has to concede to B'Elanna that there may be no afterlife (VOY: "Barge of the Dead"). On the Nechani homeworld Janeway undergoes a ritual in order to find out more about an energy field around a shrine that has caused Kes to fall into a coma. However, she is warned that all she is eager to do in the ritual is meaningless. The Doctor, who monitors Janeway's lifesigns, finds a clue that may help Kes. But when he tries to revive her, Kes's condition deteriorates. Janeway asks to repeat the ritual, this time the way it was meant to be. Now she gets the advice to take Kes to the shrine again. Although it is against all reason, Janeway carries Kes through the gate, and Kes wakes up. It turns out that the ritual actually prepared Janeway, and that the Doctor's treatment protected Kes the second time she passed the energy field. Janeway, however, doubts that everything that happened can be explained with science (VOY: "Sacred Ground"). Seven has a spiritual experience when she witnesses the Omega molecules take a stable form, which represents perfection to the Borg, "the Borg's Holy Grail" as Janeway expresses it (VOY: "The Omega Directive"). The unlikely coincidence that the same crew comes together on a ship with the same name under totally different circumstances, and that Kirk meets first Spock and then Scotty on "Delta Vega" insinuates that this could be a divine plan. A statement by Spock, explaining that the universe would strive to correct itself, was cut from the movie though ("Star Trek (2009)"). The purpose of this article is not primarily to answer the frequently asked question whether religion, particularly any of the present-day world religions, will still exist on future Earth. Rather than that, the analysis will attempt to draw an overall picture of religion in Star Trek, based on canon evidence and on background information. The question that comes to mind is if and how Gene Roddenberry's stance is represented in the various incarnations of Star Trek. His well-documented opinion that religion is mindless and primitive superstition, and that it is an obstacle to free thinking, may show up more or less openly in the franchise. Overall, we can observe that explicit anti-religious statements are comparably rare in Star Trek, even during most of the time when Roddenberry was still alive. Looking at The Original Series, we find that issues of faith (human as well as alien) are systematically kept out of the show, aside from for a couple of vague mentions and isolated statements, especially since the second season. This policy may have to do with the era when the series was produced. In the 1960s it may not have been opportune to create a decidedly atheist TV show, so Roddenberry may have been forced to drop (anti-)religious references to keep it at least secular. 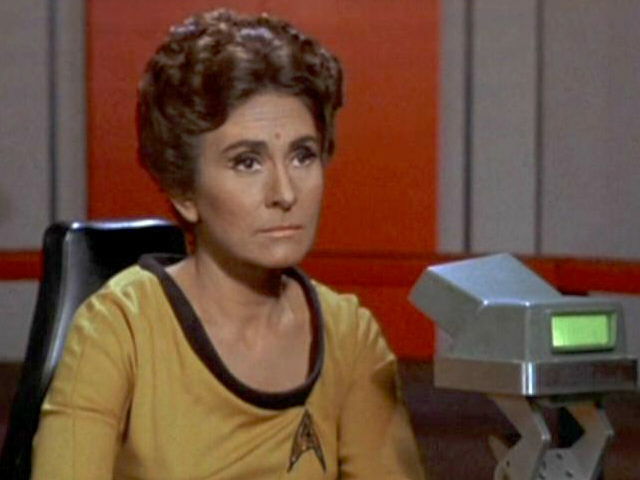 It is only remarkable that of all people in the series Edith Keeler, a church social worker of the 1930s, does not mention God on an occasion where it would have been very appropriate, while there are mentions of (the one) God in the 23rd century on other occasions, where they wouldn't belong in Roddenberry's view. Anyway, one negative aspect of religion and one that was apparently essential to Roddenberry can be found more or less systematically encrypted in several TOS episodes. It is the classic and already stereotypical "false god" plot, where god-like entities are destroyed or are uncovered as what they really are. This happens in TOS: "Return of the Archons", "A Taste of Armageddon", "Catspaw", "The Apple", The Paradise Syndrome", "Who Mourns for Adonais", "And the Children Shall Lead", "For the World is Hollow and I Have Touched the Sky" and "Plato's Stepchildren", to name only the most obvious examples. Many of these stories closely resemble one another, and most of them fail to make a moral statement except for a sigh of relief that the "false god" has been overthrown and that his/her subjects have gained their freedom. Only "The Apple" bears some more definite statements that progress can only be made in a self-determined culture. This is exactly the spirit of Roddenberry's testimony about lacking reason of religious people quoted above, and it becomes even more relevant as Vaal's followers were indeed the most primitive humanoid civilization the crew encountered during all of TOS. So irrespective of religious references the "false god" especially of TOS may have been Roddenberry's covert attempt to denounce religion as depriving people of their free will. The question crops up whether Star Trek's philosophy can offer anything to replace religion. The answer must be quite obvious to anyone who has ever listened to Star Trek's opening credits: "...to boldly go where no man has gone before." Most of all the movies, and ironically all those made under Roddenberry's surveillance, show how humanity and "enlightened" aliens likewise are still fascinated by the quest for the unknown and ultimately for the supernatural in the 23rd century. "Star Trek: The Motion Picture" and "Star Trek: The Final Frontier" even feature a spiritual encounter with a creator, although it turns out a disappointment especially in the second case. Whilst organized religion is not commonplace any longer, there is still a desire to explore the last mystery of our origin, our existence and our destiny. It is where physics and religion converge, and it may be seen as either a confirmation or an unintended (self-)rebuttal of Roddenberry's ideas. A confirmation because, in the end, science more or less inadvertently gives us the elucidation that religion always strove but eventually failed to provide. A rebuttal because here scientific interest leads to a religious experience and, the other way round, a religious desire may be fulfilled using science. If we look at it from this angle, the contrast that Roddenberry may have wanted to build up is suddenly leveled. 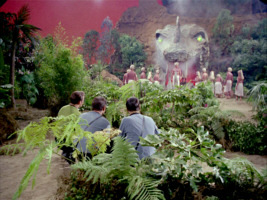 In the time of TOS, Vulcan culture used to be a blend of New-Age meditation and telepathy techniques with some ancient rituals that do not require the existence of a religion. Moreover, owing to the inherent contrast between faith and logic it seemed unlikely that Vulcans would believe in gods or in an afterlife. The movies, however, add exactly these missing links with the concepts of Sha Ka Ree and of the katra. It is astonishing that not just Spock, as a principal character, but his whole civilization turns out to be at least spiritual. While this seems to contradict Roddenberry's policy, it only emphasizes the contrast to the secular society of humanity. The Vulcan faith, its history and present will be further elucidated in TNG, in Voyager and especially in Enterprise. With Roddenberry being strongly involved in the making of Star Trek at the beginning of TNG again, his atheism becomes a prevalent tone of the new series. The non-existence of religion in the Federation is said to be equally progressive and enlightened as its non-profit economy. "Primitive" civilizations and particularly Earth's own savage past are repeatedly shown or cited as a contrast to the peaceful, wealthy and happy secular world of the Federation, just like in TNG: "Encounter at Farpoint". In a couple of stories, including TNG: "Justice", "Who Watches the Watchers" and "Devil's Due", "false gods" are exposed (not to mention Q who, however, rather enjoys being a continuing nuisance than being worshipped). Although the situation seems different, considering that the Mintakans are enlightened compared to the dull Vaal people, the outcome in "Who Watches the Watchers" is much the same as in TOS: "The Apple". Here Picard takes the opportunity to condemn religion in unconcealed and harsher words than Kirk could have chosen during TOS. Even though TNG is known to apply only mild violence compared to TOS, if any, we may only speculate what would have happened if the false Edo "god" hadn't been much more powerful than the Enterprise-D.
We may take it for granted that Roddenberry had a grudge against any church or religious community. These institutions are out, in his view, to govern their followers' lives and take away their free will just like totalitarian political systems. Many members of a religious community would probably have to agree with him thus far, knowing how much grief and destruction the bigot, warlike and corrupt conduct of their leaders has caused in human history. But Roddenberry's criticism goes beyond that, as he feels that any religion needs to be abolished and/or replaced by pure science as a prerequisite for a truly enlightened civilization. Most of all TNG: "Who Watches the Watchers" explicitly blames the faith in a deity for everything that is wrong with any religion and as an obstacle to the further development of a society. Not zealous and intolerant single individuals, not leaders that misuse religion to exploit their followers, but the very basis of any religion is condemned on these occasions. In "Who Watches the Watchers" Barron insinuates that a religion could give rise to "inquisitions, holy wars, chaos", which Picard finds "horrifying". The two, however, just look at the negative effects of religion in human history, neglecting that the same level of intolerance and violence may exist and does exist in a secular world just as well. Moreover, rather than obeying the letters of the Prime Directive that would forbid any intervention with alien civilizations in any direction, they give a personal one-sided interpretation of why it exists. The overall situation and Picard's assessment is different in "Devil's Due" where Picard is vehemently opposed to the concept of Ardra from the outset, but also recognizes that the myth of Ardra helped the Ventaxians to transform their world into a paradise. This extreme stance is alleviated to some degree on other occasions where religion is tolerated -- as long as it doesn't cause trouble. But it remains noteworthy that TNG's Starfleet with its Prime Directive ultimately shows respect for and puts up with implacable lifeforms (e.g. TNG: "Silicon Avatar"), intolerant societies (e.g. TNG: "The Outcast") or inhumane rituals (e.g. TNG: "Half a Life"), whereas it battles comparably harmless occurrences of religion with a passion. The two "false god" episodes mentioned above close with the verdict that it would be better if the respective alien civilization got rid of their religion. It seems that this general tone almost abruptly changes after Roddenberry's death with episodes like TNG: "Rightful Heir" that leave a loophole for religion in a way that it may hold some truth after all. But even in this episode that treats an alien religion with a certain deal of respect for the first time, science ultimately prevails over faith when it is discovered that Kahless is just a clone. He is not exactly another "false god", but close enough. On a different note, Worf takes over Spock's role of the principal alien character who embraces (religious) customs and mythology. TNG: "The Chase", also produced after Roddenberry's death, seems to unify all the anti-religious and pro-scientific efforts in a way that none of the various humanoid species is a divine creation, although the outcome that an ancient race is actually responsible for their existence makes it at least as mystical. The outcome may be even taken or rather mistaken as evidence for the creationist theory of "Intelligent Design", seeing that this is exactly what the proto-humanoids did. They created the humanoid races in their image and initiated an evolution which is only to a certain extent governed by random processes. Yet, promoting such ideas is clearly not the intention of the episode, especially in light of the ancient humanoids who just happen to have been the first of many alien civilizations, of which Starfleet or the Federation has never seriously considered one to be god-like. In DS9, conversely, spirituality plays a key role from the beginning. It is only speculation, but we may presume that, if at all, Roddenberry would have done DS9 very differently. He wouldn't have given much exposure to the Bajoran faith in the first place, because it would not have been practical to condemn it all the time. But before we jump to the conclusion that Star Trek's general stance may have radically changed, we need to keep in mind that it's an alien religion. Even more than the Klingon legend of Kahless, Bajoran faith may be seen as a surrogate for present-day Earth religions that are still purposely absent in Star Trek. Yet, the whole nature of this religion is very different in that the deities, the Prophets or "wormhole aliens", show up themselves, unlike it is the case with human religions. There is no need to "believe" in the Prophets' existence, as this much is proven. Starfleet is doing the Bajoran faith a favor when they deliver the proof that there is truth in their myths. On the other hand, the "wormhole aliens" are just another form of non-corporeal entities that exist in a large number in the known universe, as inexplicable their existence may remain to Federation science. To Sisko and Dax the experience of meeting them may be special, but has (not yet) any spiritual impact. For Bajoran believers it would have been the encounter of their lives. The series initially exhibits a preference for Starfleet's agnostic view that the Prophets are just "wormhole aliens". The particular conflict in DS9: "In the Hands of the Prophets" may be even seen as a little concealed allegory of the "evolution vs. intelligent design" debates with a tendency in favor of the more rational scientific explanation. The main motive why the Prophets are not downright condemned as "false gods", especially in the remarkable explanation that Ben Sisko gives to Jake in "In the Hands of the Prophets", may be that they are still needed. This provision proves right in the following story arc in the course of which the Prophets remain god-like beings and in whose ironical outcome Sisko himself, the Starfleet officer, ends up as a Prophet. It may have been easier to come up with stories with religious impact for the Bajorans than it would have been to make 24h century humans spiritual, something that Trek writers dare as late as in Voyager. Still, the Prophets definitely have a general significance for the state of religion in the franchise. The key question about the Prophets, which has not been discussed before like that in Star Trek, is what the entities would need to be classified as gods. Are they supernatural? Yes, because even the advanced Federation science can't really explain the way they exist. Are they gods? Not to the Federation, because it is simply not possible to swiftly make up or adopt a faith, like it is possible with proving a scientific theory. That's what generations of believers have been trying to make clear to generations of skeptics. But it is necessary for either side to tolerate other people's views, and that's what Ben Sisko is explaining to Jake and what DS9 keeps telling us all along. Clearly it is a diplomatic position Sisko simply has to take as someone who is a father, a Starfleet commander and a Bajoran Emissary at the same time. We need to wonder what he would have said, had he not been a representative of the Bajoran faith. Still, it remains to be noted that the reputation of religion in Trek has improved during DS9, even if it is only an exception made for recurring characters. Maybe it is easier to answer the question who would certainly not qualify as gods. DS9 too has "false gods" with the Founders. Clearly the Vorta and Jem'Hadar are enlightened enough not to worship the Founders the way the Vaal people or the Edo are looking up to their gods. This becomes especially clear when Goran'Agar talks about his "gods" in "Hippocratic Oath". They know how and why they have been created, not unlike Data who would never see Dr. Soong as a superior being either. Still, both the Vorta and the Jem'Hadar are conditioned to have that sort of ultimate loyalty to the Founders and to renounce life's pleasures just like ultimate monks. These self-proclaimed gods that create devote followers almost "from scratch" are the perhaps most obvious examples of "false gods" that simply don't deserve to be worshipped. Maybe even rather than the Pah-Wraiths, who are no more than a simplistic concept of a devil or of a "dark side" of the Prophets, the Founders stand for Roddenberry's "classic" attitude to show that religion is wrong, especially since the concept of the Dominion could easily exist without religious references. While most fans would spontaneously classify DS9 as the most spiritual series, it is surprising to see that religious issues show up in Voyager just as frequently, and with even more diversity than in DS9. First and foremost, Voyager has the honor of featuring the very first spiritual human in 30 years of Star Trek: Chakotay. But his religion soon turns out to be quite hollow. His rituals, like his tribe too, are largely made up and thus would have barely an impact on the question what has become of humanity. With all the mysteries built around Chakotay, like his "soul wandering" (VOY: "Cathexis"), the alien origin of his faith (VOY: "Tattoo") or his special dream techniques (VOY: "Waking Moments"), he has all the characteristics of an alien. And eventually, in VOY: "Barge of the Dead", he concedes that there may be no afterlife after all. 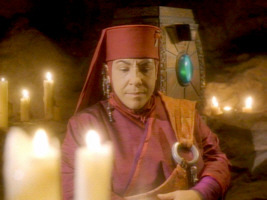 Is Chakotay spiritual? Yes, because he believes in more than he can see or his tricorder can measure. Is he religious? No, because he doesn't really practice what we could recognize as a religion. It is just a conglomerate of New Age rituals that include meditation but not something essential as the belief in an afterlife. When we look at religious topics in Trek in a broader sense, we need to bear in mind that spirituality as frequently depicted is not the same as religion (remember the Trek movies), and Chakotay is the most evident example of a person who is just spiritual. But Voyager shows much more spirituality than only Chakotay's. Gradually, almost everyone of the main cast has a spiritual experience that goes well beyond the excitement about the discovery of a new particle or lifeform. Interestingly this development goes along with a tendency that the latter discoveries are becoming boring routine on Voyager, quite in contrast to TNG where science was always much like the actual religion. On the whole, Voyager shows many of the well-known plots involving religion in a new light. The Caretaker is an interesting variant of the archetype of a "false god". But unlike Vaal or the Edo god, to whom the Caretaker is closely related, no effort is made to remove or even destroy this entity. On the contrary, Janeway decides to continue his work at any rate. Another observation along the same lines is possible in VOY: "Emanations". The faith of the Vhnori is directed towards something the Voyager crew can rationally explain. Harry helps a dissenter who doesn't want to be killed. Still, Voyager's crew tolerates their faith and ultimately allows a Vhnori woman to die (albeit inadvertently) who has accidentally materialized on the ship. There were similar situations in TNG: "Half a Life" and "Homeward", but in the two previous episodes no religion was involved. It is also clear that the Sky Spirits from VOY: "Tattoo" have much the same role in the history and religion of the Rubber Tree People as the Judeo-Christian God in the Bible. There are several clear cues in the episode such as the creation of people "in their own image" and the existence of a "chosen people" and a "sacred land". It is interesting, however, that the religion of the Rubber Tree People is not criticized in the episode, although it bears many traits of a "false god" syndrome. It wouldn't be far-fetched to say that Voyager is the Star Trek series that concedes the same rights to religions that TNG granted other cultures and law systems under the Prime Directive. In "Sacred Ground" there is an ongoing struggle between science and faith in the story in which the two alternatingly gain the upper hand. In the end, there is a scientific explanation for Kes's sudden recovery, but one that is extremely complicated and that is made possible only by a series of unlikely coincidences. So there is enough room for the myth to be true. In any case, it is one occasion where Voyager authors treat an alien religion with respect, so much that it is on par with science. On some more occasions a religion is discovered and stated to be untrue or flawed, though. But the difference especially to TNG is that Voyager does not need "false gods" with bad intentions to let religion appear despicable. Also, the series always provides a loophole that, under different circumstances, religion may prove true or useful. This is the outcome of episodes like VOY: "Mortal Coil" or "Barge of the Dead" which both don't claim to tell the ultimate truth, although especially the first one has a de-mystifying impact. Even VOY: "False Profits", basically a conventional "false god" scenario, closes with the Voyager crew fulfilling a prophecy by removing the Ferengi from the planet instead of simply destroying the myth. Essentially the same happens once again in VOY: "Muse", where the crew strives not to impair the myths which the planet's culture is built upon. VOY: "Distant Origin" is one of the stories in the tradition of TNG. It criticizes a false religion that has become a political ideology. Still, there is largely no spiritual impact, although Prof. Gegen's struggle against the "doctrine" (a term taken from political science, not religion) of the Voth is very reminiscent of Galilei's efforts to defend his teachings against the church. To paraphrase Lenin, "Religion is the opium of the people", but in its consequences, political ideologies like fascism and communism have become the ultimate religions of the 20th century, so the example of the Voth may be fitting as "false religion". In this context it is interesting to note that, although basic concepts like racism are condemned, concrete examples of fanaticism of political leaders are not quite as frequent in Star Trek as occurrences of "false gods". Clearly the two phenomena are closely related, but the authors may have deemed it more interesting to give a political conflict an additional spiritual aspect. Enterprise continues with the trend established in Voyager. The monks in ENT: "The Andorian Incident" are treated with great respect (at least in the beginning), as are the pilgrims in "Cold Front". Only "Chosen Realm" continues where TNG left -- with a clear-cut stance that religion is bad. We may excuse Archer's statements. He was in a rage, and he would condemn anyone or anything for the cruelty of the Triannon hijackers, who have killed a crew member and are going to execute another one. But considering that he has a perfect personal enemy in the leader of the terrorists, why should he focus on something like their faith that is quite abstract and that he hardly knows anything about? Sadly, this is just like on 9/11 President Bush had universally blamed Islam for al-Qaeda's crime. Aside from that, it is also interesting to note that the Triannon, who have apparently never met the Sphere Builders, worship them as gods, whereas the Xindi don't. In the following the series remains largely secular, with the notable exception of the Vulcan arc in the fourth season, when Archer experiences Surak's katra and the Vulcans ultimately rediscover their lost faith. This episode adds even more religious aspects to the Vulcan culture in history and present, although this doesn't happen unexpectedly because the episode arc is written to be perfectly in line (continuity-wise) with previous Star Trek series. Well, and Enterprise used to have "Faith of the Heart" ;-). One question will probably remain unanswered because it was never meant to be posed in the first place. We can't tell how many humans still believe in someone like a god or like gods in the 22nd to 24th century. At least priests still perform wedding ceremonies, as Kasidy suggests in DS9: "Penumbra". Aside from that, human religion has almost no place in Star Trek except for subtle and mostly insignificant side notes. Roddenberry could not afford to lose a large portion of his viewers because of his open atheism, so he largely left out (negative) references to Earth's religions. 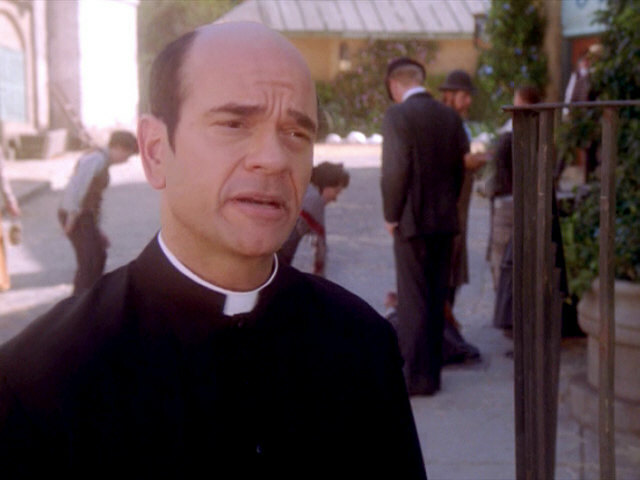 The only exception is in VOY: "Spirit Folk" where the Doctor plays a Catholic priest, yet in a false church largely devoid of religious symbols on a holodeck. On a related note, it may seem fair and balanced that none of today's world religions really shows up in Star Trek. That way, it may be easier to see humanity as a whole and not as people who are guided or, as Roddenberry would probably put it, misled by their various respective religions. On the other hand, such a benevolent excuse becomes questionable if we take into account that Star Trek never made any effort to correct the undeniable ethnic and national preference concerning its characters, as if it took place in 20th century USA. Considering this strong political bias, where would lie the problem in making certain characters Christians, Jews or Buddhists? First off, I don't think that science fiction is a literary genre that should frequently explore religious issues, depict religious societies, or even promote them as a desirable vision of the future. Living with faith instead of atheism is just one option that many people on this planet have chosen for themselves. Except for a couple of barefaced failings, Star Trek is largely free of clear-cut anti-religious statements. Fortunately. Because it would be hard to condone an utopian fiction of a better society if it were systematically intolerant in one respect. Star Trek's stance on religion has a clear tendency to become more balanced since DS9 and especially Voyager, although the prevalent tone is still agnostic. Religion is not only tolerated since then, but is also seen as an opportunity to come up with attractive new plots that would have fallen under Roddenberry's presumable ban on religious issues. On the other hand, with other contemporary science fiction, fantasy and mystery series focusing even more on the mystical, Star Trek may have just been following a general trend. Gene Roddenberry failed to recognize that religion is typically not something imposed on people, but that human beings have always been seeking for explanations of the world, for a code of behavior and for the perspective of an afterlife. The whole point of atheism is that nothing exists that we could believe in. Star Trek frequently shows that there is someone or something divine indeed, only that this always winds up as a "false god" that does not deserve to be worshipped. However, an impostor posing as a "god" is not the same as a religion, even if we allege that all religions are ultimately man-made. And who says that religion needs an idea of a concrete person or entity as "god"? Star Trek itself has discussed spiritual issues without a reference to a god numerous times, it is full of spirituality that just pretends to be of profane scientific nature. Roddenberry's atheism is a personal idea that found its way into Star Trek. There are remnants of this part of his heritage despite frequently changing producers and writers. This is good for continuity, but debatable as a vision for the future. Roddenberry condemned religion because it suppressed people in his view, which is definitely true for some eras of human history. But he did not look at the other side of the medal that, quite contrary to his statement that religion is making people dull, it has enriched Earth's cultures and even science in the course of the centuries. What would our world be without all the magnificent cathedrals and temples, without music and literature being constantly inspired by religion, without scientific interest that has its roots in the desire to be closer to god(s)? And if we don't need religion any longer in modern times, where would we have to draw the line? Ironically, the few examples in which Trek characters explicitly condemn religion on screen show primitive cultures that are held back by a "false god". This does not comply at all with the general course of Earth's history. His reasons for rejecting religion stand against the fact that billions of religious human beings on present-day Earth live in relative peace and tolerance. There are certainly fundamentalists who do not respect other views than their own. However, just like political fanaticism this is just an outgrowth of the human nature, not of the idea of religion. It is simply unfair and counter-productive to ignore the ways of life of the majority of humanity in an effort to depict Star Trek as a desirable future for them. In order to achieve Roddenberry's utopia some day, we could ponder about abolishing everything that might be subject to misuse or what might restrict our freedom. But then we could question the existence of just every technological, cultural, political or social custom, law or institution, anything that makes up our lives. With a firm stance that it would be better to take away faith from people, Star Trek, in its few worst installments, is just as narrow-minded and arrogant as the religious zeal it strives to condemn. On these occasions Star Trek acts against its own principles. Whatever his reasons were, Gene Roddenberry was mistaken about religion. I am glad that he hit the nail on the head with other ideas that he came up with. Thanks to Daystrom Institute Technical Library where I found the Roddenberry quote. 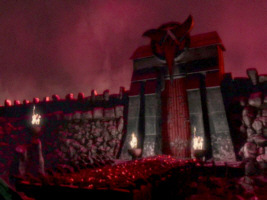 The site is also the origin of the "false god" classification. Special thanks to Gregory Price, who added several references about Vulcan faith and spirituality, and to David Brown more more examples of human religion in TOS. The observation about Edith Keeler comes from Michael A. Burstein in Boarding the Enterprise. Thanks also to Jörg Hillebrand for the picture of the cross, TrekCore for several screen caps, Julian for reminding me of more occurrences of human religions in Trek, to Jorge Hernandez for a hint about "Balance of Terror" and to trlkly for reminding me of facts from TNG: "Tapestry" and VOY: "Sacred Ground".